On view in the UrbanGlass storefront, this special exhibition highlights the talents of jewelers from UrbanGlass|ware's extensive roster of artists expanding the understood boundaries of this unique material. Featured jewelers test the boundaries of scale, materials, and concept- expanding upon their current collections. Don't miss this chance to expand your collection with truly innovative design! View the catalog of works in UrbanSparkle on our website! 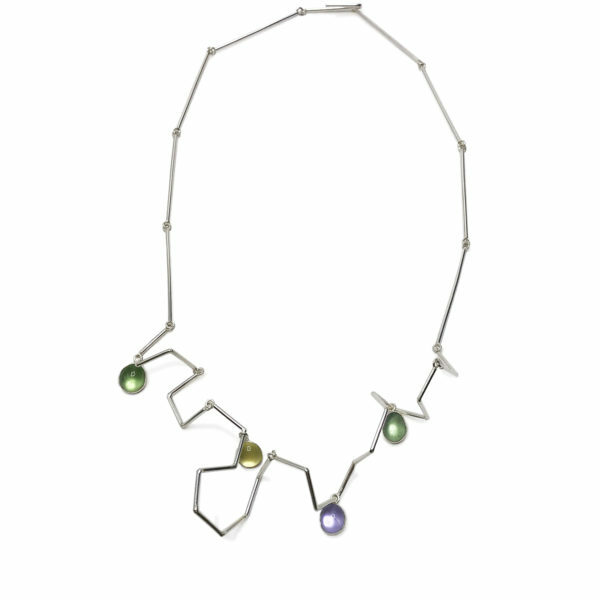 This exhibition coincides with the inaugural year of New York City Jewelry Week, NYC’s first and only week dedicated to promoting the world of jewelry through educational and innovative NYC focused programming. Join us for a demonstration by Amy Lemaire and Bianca Abreu of their jewelry making process on November 17th, in our studio. 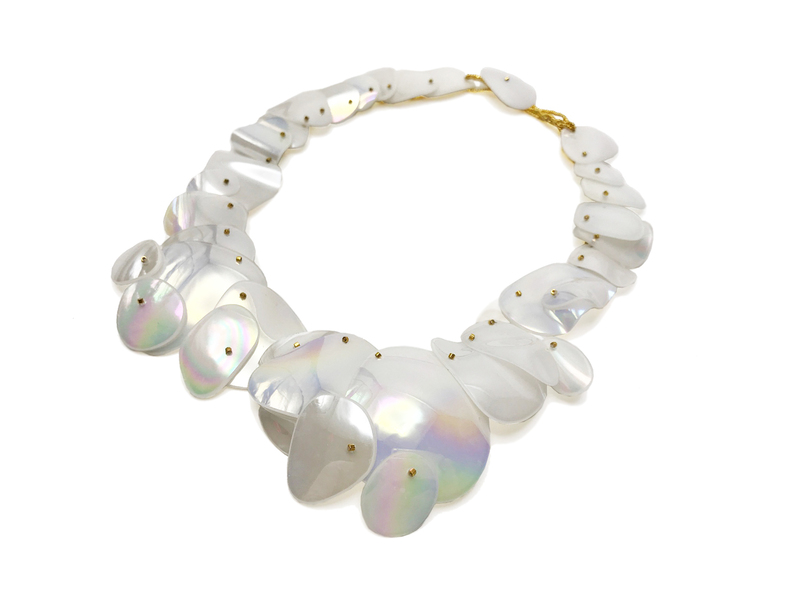 Bianca Abreu makes jewelry that transforms throughout the day. 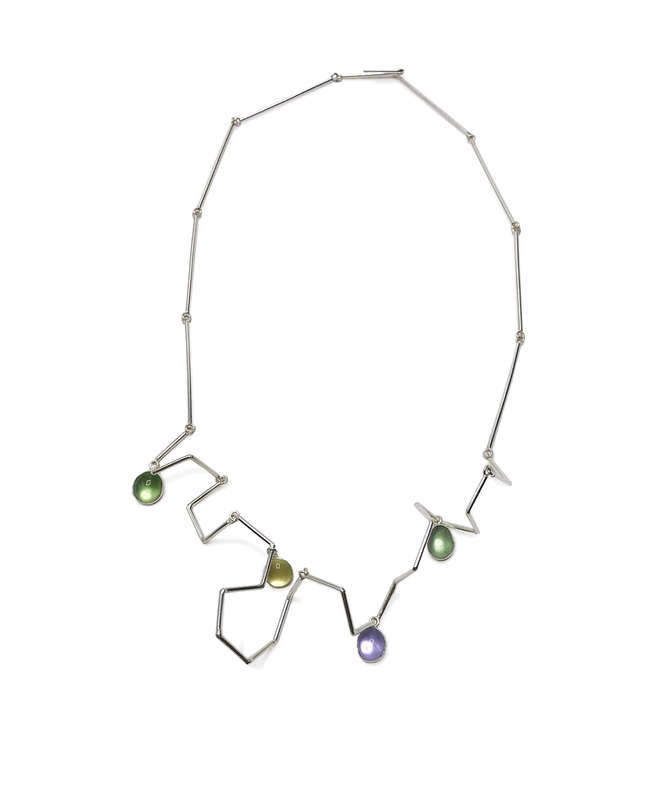 Color-shifting from aqua to purple, yellow to pink, green to grey and lavender to blue, her handmade earrings and pendants are an exploration of spectrum and light. Bianca Abreu fabricates her AUR Jewelry designs in Brooklyn, NY. Lara Knutson is an Artist and Industrial Designer living and working in New York City. She received a master’s degree in Industrial Design and a bachelor’s degree in Architecture from Pratt Institute and believes her work is informed by the interplay of light, space, materials and structure that unite these two disciplines. Amy Lemaire is a multi-disciplinary artist based in Brooklyn, NY. She received a BFA from School of the Art Institute of Chicago in 2000 and an MFA from Pratt Institute in 2010. 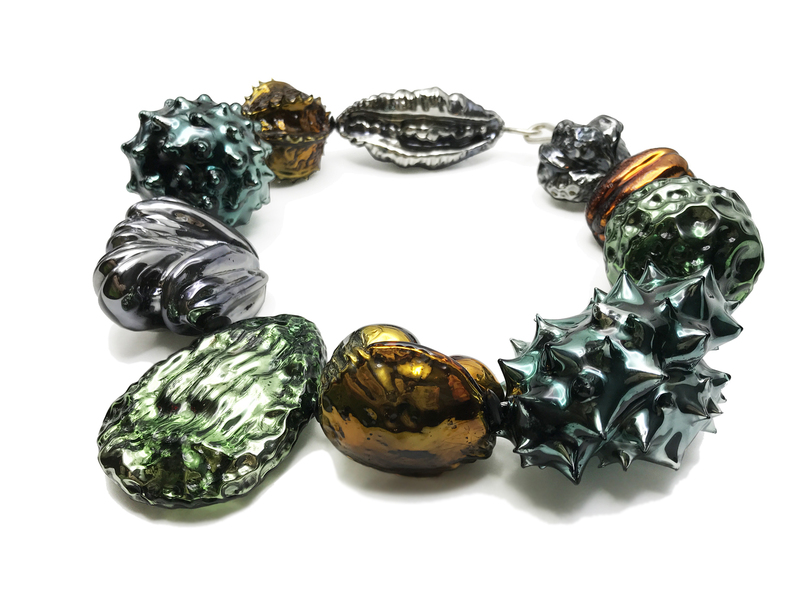 Amy is currently the Director of the Bead Project at UrbanGlass, where she also makes her glass-work. She exhibits her work nationally. Brooklyn based artist, Alexandra Lozier, combines blown glass and fabricated metal elements to preserve and display precious nostalgic found objects. Inspired by the ﬂeeting beauty of nature, she collects and encapsulate organic specimens in an attempt to preserve my memories; observing mortality, eternalizing the ephemeral. The Ancient Truth Investigators (ATI), is a project by Brooklyn-based artist, Rachel Rader. At the center of ATI are objects made of glass, metal, fibers, and other materials that are fabricated to look like mythical versions of geological specimens. ATI is a narrative-driven exploration in performance art, wearable objects, and sculptural forms. While in character, Rader embraces the persona of the Chief Investigator of ATI. 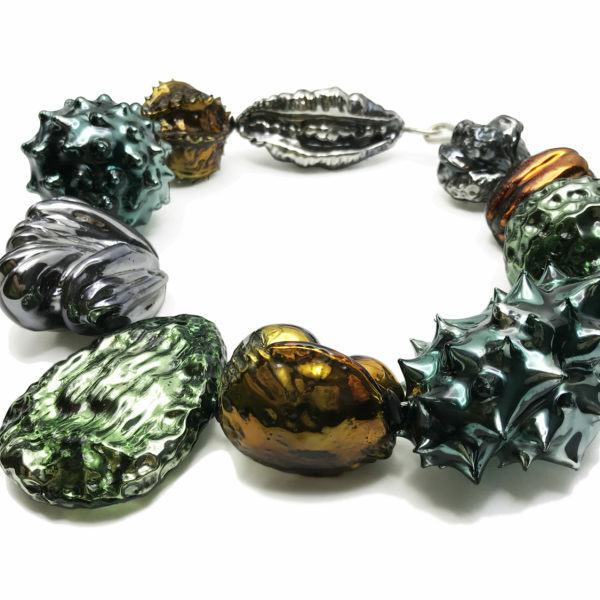 Penelope Rakov makes her highly detailed glass jewelry in New York, where she has honed in her approach to murrine. Each piece is carefully carved, and then set in sterling silver to highlight the elegantly refined detail of her glass work. Brooklyn-based artist, Erica Rosenfeld, creates glass jewelry using a technique called murrine, which involves pulling detailed patterns in glass cane that are revealed when cut in cross-sections. Each piece is kinetic because of how she constructs her artwork. Annie Shepherd is a Brooklyn-based glass artist whose work revolves around themes of place, belonging, and cartography. These carved pendants, featuring maps of thoughtfully selected locations, are offered in a variety of colors and set in a handmade fine silver bezel with accompanying chain.